When two people fall in love with each other, barriers like languages, religion or nationalities hardly matter for them. What is important is the loving hearts. But when it comes to wedding, there are some important factors to consider and one of the most important among them is union of two families, and not just two individuals. And if these two families belong to two different cultures, their union may be a little daunting for the man and the woman loving each other. In that case, a fun way to provide all the information about the wedding, in both languages to all the guests belonging to both the cultures through a single convenient entity is to create a wedding website. A wedding website lets you enjoy the prenuptial as well as nuptial atmosphere, your preparations, suggestions, comments, advices and also some hilarious moments. 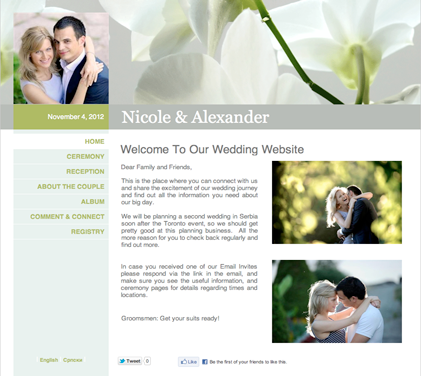 Look at this beautiful sample wedding website created for an English-Italian couple, Nicole and Alexander – http://www.twowed.com/nicole&alexander. Nicole and Alexander are creating a multicultural wedding with Two Wed through which they are sending their email wedding invitations in English and Italian. 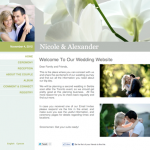 Friends and family of Nicole and Alexander can easily catch them on their wedding website anytime they want. They can share various things with them, suggest them various things like choosing vendors, venue, makeup, etc, and also watch their wonderful photos. No chance of break in communication, as whenever both of them will log into their wedding site, they can see messages from their guests, answer their queries, think upon their suggestions, share things with them and thank them for being a part of all the excitement. Two Wed is a Canadian service that combines the most sophisticated web innovations and modern wedding planning. They create your wedding website with the intention of bringing friends and family together for the celebration in a simple and fun way. With the Two Wed wedding websites you can connect to those who care for you and send them online invitations. Two Wed supports more than 20 languages. They include premium designer templates. The wedding invitations created by Two Wed are interactive. You also get integrated social media, maps and photo album – so much fun! You can get suggestions, advices and comments from your guests through the social media. You can easily navigate your guests through the maps and you can keep publishing lots of photos in a convenient way – to enable your guests to see them anytime, anywhere. Two Wed also offers a free 30-day trial. Just $29.95 for unlimited use! A wedding website is an extremely useful entity because you can contact your overseas guests too through it. It is a one-time investment and you can enjoy it forever. Even after your wedding, you can use it to keep in touch with your existing friends and family, make new friends, share your photos and letting others share their photos, and a lot more. If your big day is around the corner, visit Two Wed today and get a lovely wedding website for you so that you and your guests won’t miss anything in the fun!